Retail Channel - Truck and Travel - Ingram Entertainment Inc.
Ingram Entertainment, Inc. values our relationships with our truck and travel customers and we strive to provide support and service for a successful partnership. Our fastest growing segment is in the truck stop and travel center business where our program has produced excellent results. Ingram uses our expertise, wide range of resources, and our strong vendor relationships to provide outstanding service to this exciting channel and see to it that it remains our fastest growing segment! Our ability to adapt and evolve has given us an advantage. The key to our program is increased turns by providing the best product available with very competitive margins. We are the only distributor to the truck and travel center class of trade that is direct with every movie studio, audio book manufacturer and all major music companies. With Vendor Managed Inventory (VMI) and Category Management (CATMAN), we make it nearly effortless for our Truck & Travel partners to excel in this category. With dedicated staff and several retail service specialists for truck and travel, there is always someone ready to listen and understand your needs and work with you to create a successful revenue source in your stores. Whether you need assistance with an initial rollout or a transition team from a current distributor, our team is here to help you with: turnaround, scheduling, installation and store compliance issues. We also work directly with permanent display companies to create customized in-line, free-standing, dump-bins and eye-catching signage that will look great in your place of business. In short… Top Selling Product – Great Displays! Ingram also houses a dedicated mini-warehouse within our largest warehouse that manages our truck and travel customers. The mini-warehouse currently has 5 alternating zones created for speed and efficiency for DVD, Blu-ray, Music and Audiobooks category. This commitment to the Truck & Travel class proves that we are willing to do whatever it takes to help our partners maximize profits. You will always be in communication with us. We also provide tracking and reporting, replenishment reports, scope of work, timeline by store with regular updates to the buyer’s corporate office. a. Large basket on top to hold promotional items, such as 2 for $12, or 3 for $20 DVD’s. b. Lower shelves on 4 sides to hold popular categories/price points, such as $19.98 TV Series, Graphic Audiobooks, $9.98 DVD’s and more. 2) Island Display – Roughly 5’ x 2’ – 4 sided walk around display. a. New Releases on one end on secure pegs. 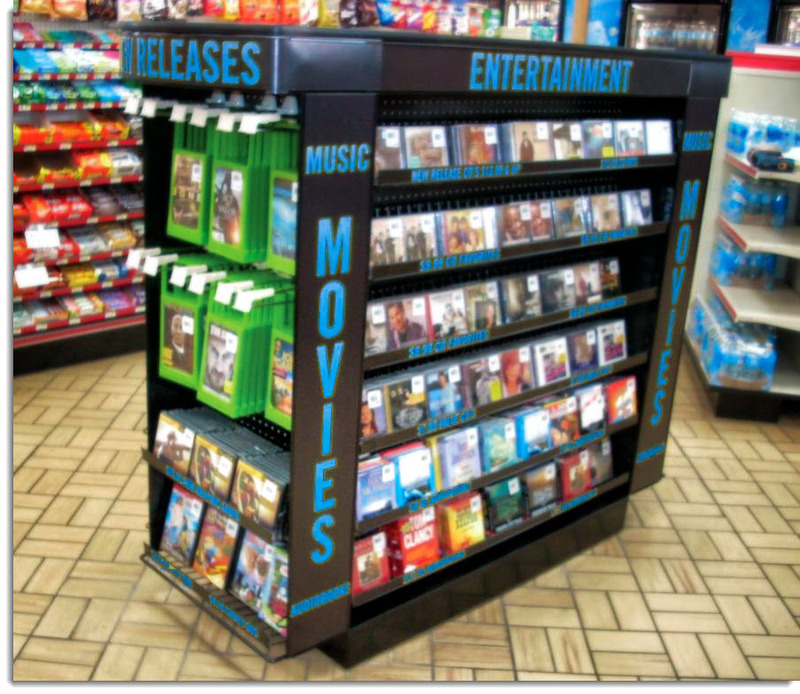 3) Endcap Display – 36” x 24” – 3 sided displayc. Audio Books and Music CD’s on the other side and end. a. New Releases on front on secure pegs. b. Additional shelving for popular price points of DVD, Audio Books and CD’s. a. Typically is used in conjunction with an Endcap, but can be merchandised as a standalone. a. 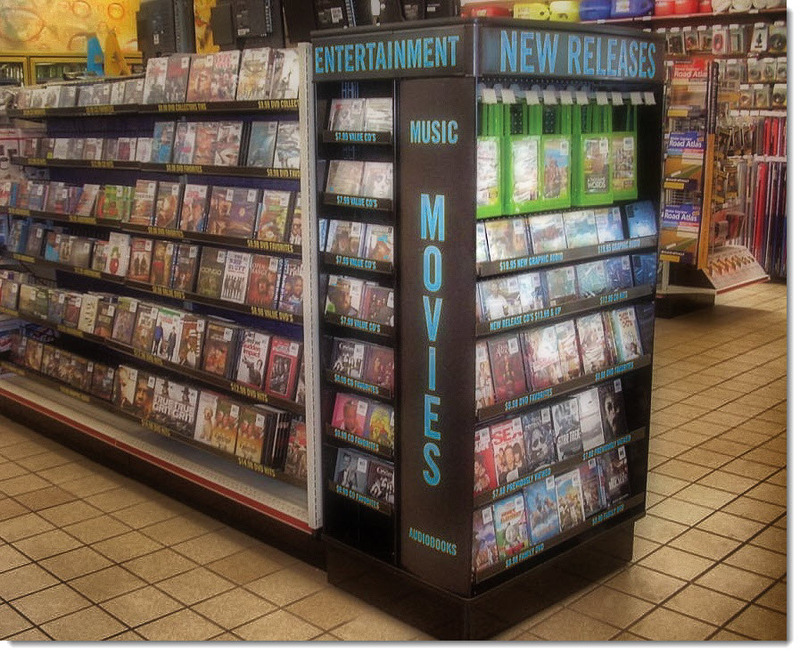 Promotional DVD’s – special buy opportunities which allow aggressive retails with full margins – i.e. 2 for $12, 3 for $20 or BOGO’s. b. New Release DVD’s – Typically retailing around $23.99. Can be packaged for display on security pegs. c. $19.98 TV on DVD – Very popular with professional drivers. Often retailing in other stores for $29.99 – $49.99, we have these products available at a hot $19.98 retail. d. $9.98 DVD Favorites – Our most popular price point. 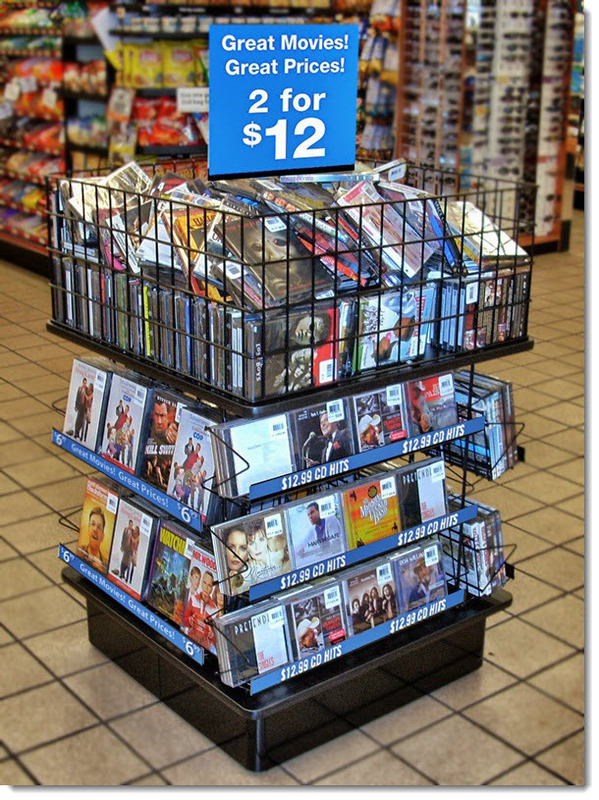 e. $14.98 DVD’s – Multi-film packages or recent releases. f. Blu-rays programs can also be discussed. a. $19.98 Graphic Audio Books – A best seller and the most popular audio book product for professional drivers. b. $9.95, $14.95 and $19.95 traditional audio books. b. $12.99, $9.99, $7.99 and $5.99 catalog hits.